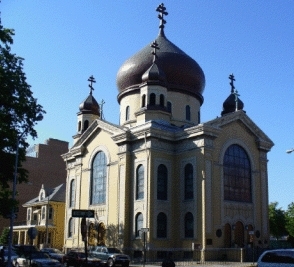 This year, the Julian Calendar Christmas ~ 7 January ~ was celebrated at the Russian Orthodox Cathedral of the Transfiguration of Our Lord in Brooklyn NY. The parish rector (Very Reverend Wiaczeslaw Krawczuk) and faithful were blessed to welcome His Grace, Bishop Michael, who served the Nativity Vigil service on the eve of the feast-day and, following the service, joined church members for a traditional Russian “Holy Supper” in the church hall. The faithful were also blessed to welcome Bishop Michael for the festal Divine Liturgy at 9:30 a.m. on “Old Calendar” Christmas Day. His Grace was greeted by Peter Andryuk (parish Vice President) and Father Wiaczeslaw who welcomed him to the church with warm words and happiness; also, by excited Church School students led by Marta Kliszcz, who presented flowers to the Bishop. Serving at the Divine Liturgy were Sub-deacons Roman Ostash and Vladimir Chaykivsky of Saint Tikhon’s Seminary, and (from the parish) Peter Andryuk along with 12 altar servers. Several visiting clergy participated as well: Very Reverend Bohdan Ostash (Alpha NJ); Very Reverend Daniel Degyansky (Woodside NY); Reverend Boris Slootsky (Mays Landing NJ); Reverend Igor Ksynyuk (Bayonne NJ); Protodeacon Paul Sokol (Manville NJ). The celebration filled the Church with over six hundred people. Then, following the Liturgy, all were invited to a lunch to break the Christmas fast. The mood was joyful as everyone shared a nice meal and great company. Church School children presented a brief Christmas performance for His Grace, playing instruments, such as flute and piano, and singing Christmas Carols in both English and Ukrainian. The fellowship concluded with warm wishes for the Christmas Holiday and the New Year.